Free events Rockefeller Memorial Chapel. The University of Chicago’s non-denominational Rockefeller Memorial Chapel offers free events throughout the academic year. When: Check schedule availability varies. Tower tours begin at 11:30 am and 4:30 pm every weekday, and at 12:15 pm when University is in session. Go to the front desk to climb the tower with the Carilloneur. The climb is 271 steps to visit the 72 bells in the chapel tower. The carillon is played at 12 noon and 5 pm weekdays when University is in session. The carillon is also at many other times for academic ceremonies, weddings, and other events. The carillon consists of 72 bells and 100 tons of bronze. Come and hear University organists play a mixture of Baroque, Romantic, and contemporary music on the E.M. Skinner organ. They take requests. The E.M. Skinner Opus 634 organ was built with the Chapel itself in 1928. The organ is one of four University organs of the American organ-builder E.M. Skinner (the others are at Yale, Princeton, and Michigan). These organs are considered among the finest examples of 20th century romantic organs built in America. The chapel hosts other events throughout the year check the schedule here. Rockefeller Chapel was designed by early 20th century architect Bertram Grosvenor Goodhue. 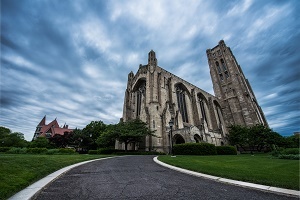 It was completed in 1928, the final gift to the University of Chicago from benefactor and founder John D. Rockefeller, for whom the Chapel was named after his death. Built entirely of stone, with the exception of steel supports for the tower’s carillon and beams which carry the weight of the roof, it is lavishly decorated on the exterior with sculptures representing the humanities and the sciences. The tower stands 207 feet high and can be ascended via a spiral stone staircase of 271 steps. Rockefeller Chapel is 265 feet long and 102 feet wide at its widest point. The interior ceiling (a false ceiling, inside the roof) is just over 79 feet from the floor. The Chapel weighs 32,000 tons, and 56 concrete piers carry the foundations down to bedrock 80 feet below the floor. The walls contain 72,000 pieces of Indiana limestone, and the ceiling is decorated with 100,000 pieces of colored Guastavino tile. More than one hundred stone sculptures decorate the outside of the Chapel, designed by Lee Lawrie (1877–1963) and Ulric Ellerhausen (1879–1957).